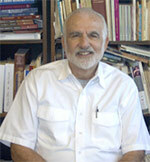 Dr. Hart is the Moores Professor of History and one of the nation’s foremost scholars of Mexico. For more than 40 years, Hart has explored multiple aspects of the Mexican Revolution, the influence of the United States in Mexico, Mexican and Mexican American Labor, and the Mexican rural working classes. Hart received his Ph.D. in Latin American History from UCLA in 1970 and has taught at the University of Houston since 1973. He has been the recipient of the Faculty Excellence Award and has served twice as chair of the History Department. Dr. Hart has served as a Distinguished Visiting Professor at the Historical Division of the National Institute of Anthropology and History (INAH), and at the National School of Anthropology and History (ENAH) in Mexico City. He has lectured extensively in the United States and abroad including Magisterial Addresses at INAH, ENAH, the National University of Mexico, the Universities of Nuevo León and Puebla, and the Universidad Regiomontana de Monterrey. He has won numerous research, book, and article awards including the Conference and Bolton-Johnson Prizes for best article and best book of the year from the Conference of Latin American History (CLAH), the Latin American Division of the American Historical Association. The American Council of Learned Societies has placed his Revolutionary Mexico and Empire and Revolution on their prestigious all time list of 1,000 and 1,250 ebooks respectively, while Choice placed his Empire and Revolution on their “Outstanding Academic Titles” list in 2003. More recently, the Rocky Mountain Council for Latin American Studies, the oldest and largest division of the Latin American Studies Association, awarded Empire and Revolution the Michael E. Meyer Prize as the best book on Mexican History published between 2003 and 2008. He has also received a Distinguished Life Membership for his scholarship from the Southwestern Council for Latin American Studies and served as President of the International Association of Mexican Historians from 2003 to 2007. Dr. Hart’s recognition in the United States includes one year fellowships as a Shelby Cullom Davis Research Scholar in the Davis Center for Historical Studies at Princeton, a Senior Scholarship at the U.S.—Mexico Studies Center at the Center for the Americas at the University of California, San Diego, a Senior Research Fellowship with the National Endowment for the Humanities, and post doctoral advanced research grants from the American Council for Learned Societies, the Social Science Research Council, and the American Philosophical Society. He has served on the Board of Directors of CLAH and has published six books and 60 articles in academic presses and journals. Dr. Hart offers graduate seminars and historiography courses on Modern Mexican History and undergraduate classes on Mexico, anarchism and U.S.--Mexican relations. He has served on numerous M.A. Thesis and Doctoral Dissertation committees and the student he has directed have published fourteen history books with academic presses in addition to other books and articles. They have won many national and regional prizes. Hart is the author of six books and 60 articles in United States and Latin American presses and scholarly journals. He recently completed his forthcoming book The Silver of the Sierra Madre: "Boss Shepherd" and the People of the Canyons. Empire and Revolution: The Americans in Mexico Since the Civil War (The University of California Press, 2002). Spanish edition published by Oceano and the Consejo Nacional de Cultura y Artes (Mexico City, 2010). Revolutionary Mexico: The Coming and Process of the Mexican Revolution (The University of California Press, 1987). El Mexico revolucionario: gestacion Y proceso de la revolucion mexicana (Alianza Editorialo Mexicana, 1990). Border Crossings: Mexican and Mexican-American Workers, (Scholarly Resources, 1998). Anarchism and the Mexican Working Class, 1860-1931 (University Press of Texas, 1976). El anarquismo y la clase obrera mexicana, 1860-1931 (Siglo XXI, 1980).